The interview series poses questions concerning the role of affects and emotions in research practice and contemporary society to researches on short-term visit and associate members of the Collaborative Research Center „Affective Societies“. 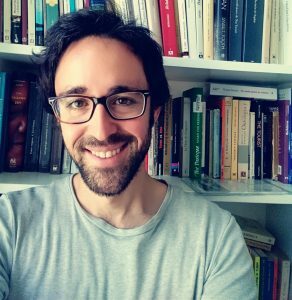 Today, we introduce Aníbal Arregui who studied Social Anthropology at the Uni Barcelona (PhD 2013). As a postdoc, he has been affiliated to the University of Rostock and CEFRES-Charles University (Prague). Anibal has conducted fieldwork in Brazilian Amazonia with ribeirinhos and quilombolas, and in Barcelona around humans-wild boars interactions. His research interest is on how different human corporealities shape the articulation of particular human and nonhuman worlds. During his stay at the Collaborative Research Center he will give a public evening lecture entitled „Positional Beasts: Amazonian ribeirinhos, pink dolphins, and the affections of wildness“. The lecture will take place on November 29, 2018, 6.00 pm. For further information, visit the CRC Website. In the last year I have been thinking about something I am tentatively calling „positional wildness“. I see it as the ways in which the potentials for hostility and companionship are in part negotiated at a corporeal scale among some species. With this I intend to look at some relational variability within the categories of „species“. For instance, I am starting to observe that particular members of different species can relate to one another either aggressively or friendly (so to speak), and that what decides the sign (positive or negative) of the affective engagement is not only the genetic prescription of the species, but also the particular corporeal histories of particular members of these species. In particular, I am using this idea of the „positional wildness“ to try to understand two interspecies relations that are key to understand the human-nonhuman engagements in my two current ethnographic fields: In Brazilian Amazonia I am currently looking at riverine settlers – pink dolphins relations; in Europe I look at the sharing of peri-urban areas by humans and wild boars. Recently I was surprised by the emotion of the possibility of coming back home (Barcelona), for professional reasons. It’s a very strange feeling, because it contains the prospect of recovering this everyday affective live in which I grew up (for the proximity to family and friends, and for the familiarity with the general ways of relating to people) . So it is a promising and positive emotion in this regard. And yet, the emotion is also one of uncertainty, because I know Barcelona is not the same I left seven years ago. And because I precisely left the city for some reasons! Anyway, it is very likely that I will come back and the emotion is that of a vertigo. I started in academia with a certain megalomaniac feeling of „I will affect the world“ (you know, reading or „thinking with“ Lévi-Strauss, Schopenhauer, Freud, etc…) . That was my driving force during grad, MA and even PhD studies. Then I realized that the part of the world I will actually affect is so tiny that I would call it „my family“. So this is my driving force now, the part of the world I am more than happy if I can affect positively. As for the affective barriers… yes, it is difficult to play with affective distances in academia, in general. I have been kind of a detached, lonely wolf for long time, and now I realize more and more that, in the real job-world, academia is not a community of intellectuals, meaning a place where you are evaluated according to your ideas or intellectual intervention. What makes the community is not the intellectuals, but the persons, as everywhere else. So the barriers I need to surmount now are these of learning to affect and be affected (again the pedantic-megalomaiac Spinozian vein, which is apparently still there) not as an intellectual, but as a person. You german speakers call it „Vitamin B“. It’s not a likable thing, and yet, I am starting to think we need to embrace it, because we scholars are persons much before we are „intellectuals“. Dance of the Dolphin. Transformation and Disenchantment in the Amazonian Imagination (1994), by Candace Slater. I came across the book while writing the first ideas on Amazonian-pink dolphins. I discovered that Slater (a literature scholar) did so much ethnographic work on the topic, and very much on the same region I conducted my fieldwork! Slater was in the lower Amazon in the early 90s and documented so many stories about riverine populations and pink dolphins. I felt really reassured in seeing that crucial parts of what I observed between 2006-2016 had been documented before. I still could keep my particular ethnographic contribution (focusing on practices and embodiment), but with the certainty that my cases were not weird or isolated, but containing something important of lower Amazonian imaginaries and practices of interspecies relations. Plus, the book is really well written and structured, without metaphysic grandiloquences. Just written to be understood and liked. I would like to refrain from the feeling that there is no safe place in the world now, that everything is in crisis (economic, ecologic, etc), that fascists are taking over all around the planet … I would like to instead feel this is a necessary step in human history, a watershed towards something better. I need a historian to tell me this is how it has always been: changes, crisis, etc. Anyway, I could understand the facts, and agree rationally, but not feel it, probably. I don’t think that even historians can see this particular moment from above and say „no matter, this always happened and here we are“. Even if that’s the evidence of history, I think that refraining from the feeling of urgency is inimical to political action and gives the victory to those who are not very good at feeling… so, actually, I don’t want to refrain from any „crisis“ feeling. Perhaps feel the crisis in a more energizing way?